In a Christmas surprise that delighted parents, the FDA approved the drug nusinersen (SPINRAZA®) to treat young children with a severe and potentially fatal illness called spinal muscular atrophy (SMA). Cold Spring Harbor, NY — Within a week of Christmas day, a drug called nusinersen (Spinraza) will be in the hands of doctors across the nation, who will use it, most urgently, to treat young children with a severe and potentially fatal illness called spinal muscular atrophy (SMA). 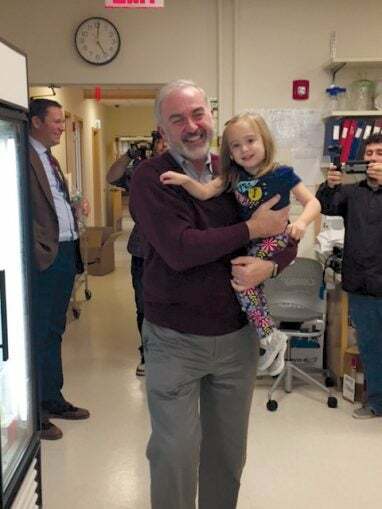 Nusinersen’s inventor, research scientist Dr. Adrian Krainer of CSHL, with Emma Larson, a 3 year old who has been helped by the newly approved drug. The leading genetic cause of infant mortality, SMA is a motor neuron disease that leads to the wasting of young muscles, impairing the ability of newborns and toddlers to walk, crawl, or even hold their heads up, and in the most severe cases, failure of muscles that enable them to breathe. Nusinersen (to be sold by Biogen under the brand name Spinraza) was conceived and tested over several years in mouse models of SMA by Professor Adrian Krainer, Ph.D., and his colleagues at Cold Spring Harbor Laboratory (CSHL) in collaboration with drug developers led by Dr. Frank Bennett at Ionis Pharmaceuticals. Their collaboration began a dozen years ago. Ionis Pharmaceuticals says nusinersen’s FDA approval under so-called Priority Review clears it for use in both pediatric and adult SMA patients. The drug, which is the first approved therapy for SMA, performed impressively in clinical trials testing its impact across a wide range of SMA patients, from just after birth to age 12 and beyond. The conclusion so far is that the earlier the drug is administered in patients, the more it helps them. A clinical study continues that is testing the drug’s ability to prevent the illness in newborns who are genetically destined to develop it. All SMA patients share one aspect of pathology: they no longer have a working copy of a gene called SMN1 (“survival of motor neuron”). As its name implies, the gene encodes a protein essential for the development and survival of motor neurons. Without it, patients must rely on a nearly identical gene called SMN2. It’s a poor backup, though: the SMN2 gene (in all people) has a DNA error that usually prevents cells from manufacturing functioning SMN protein. 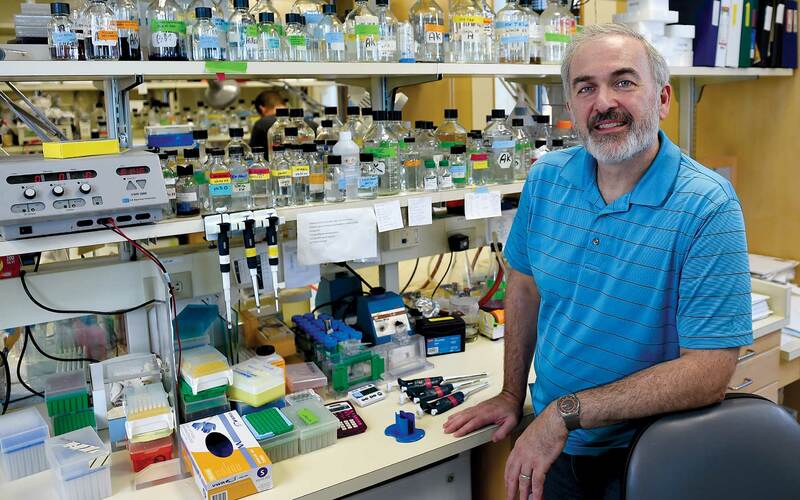 Dr. Krainer, a world authority on a cellular process called RNA splicing—the editing of RNA “messages” copied from our genes—conceived of a way to compensate for the error in SMN1 by correcting the defect in SMN2, which is caused by a failure of the splicing mechanism to “edit” the gene’s RNA message properly. In coordination with Ionis scientists, Krainer’s team designed, synthesized and tested tiny molecules of modified RNA called antisense oligonucleotides (ASOs), which, when delivered to cells, bind at a specific site on the unedited RNA message made from the SMN2 gene. The ASO’s binding has the biochemical effect of fixing the splicing error responsible for non-functional SMN protein. In early tests, the ASO was delivered to the spinal cord of mice modeling SMA pathology. It was taken up by motor neurons and led them to manufacture functional SMN protein, which in turn had the effect of preventing SMA-like pathology. Human testing sponsored by Ionis began in 2011. The data upon which the FDA’s approval of nusinersen was based included results from hundreds of patients. “Infantile-onset patients achieved and sustained clinically meaningful improvement in motor function compared to untreated study participants,” Ionis reported. In other, non-randomized, trials “some patients achieved milestones such as ability to sit unassisted, stand or walk when they would otherwise be unexpected to do so, and maintained milestones at ages when they would be expected to be lost,” Ionis said. One child who has benefited is Emma Larson, a lively 3½-year-old from Long Island, whose parents sought Dr. Krainer’s counsel when she was diagnosed with Type 2 SMA over two years ago. Dianne and Matthew Larson later enrolled Emma in a clinical trial, when she reached her 2nd birthday. She was already losing the ability to crawl, and to hold her head up without assistance. Within 2 months of receiving her first injections of nusinersen, Emma began to improve. “It was a miracle,” Dianne Larsen recalls. One day Emma crawled all the way from the living room to her mother’s bedroom, catching her completely by surprise. “I was freaking out! I couldn’t believe she had crawled all the way!” Dianne remembers. Today, Emma continues to receive injections and to improve. She is graduating from a walker to crutches, and getting ready to join her peers in preschool. Dr. Stillman, echoing Dianne Larson’s joy, took the occasion to note that the applied research leading to nusinersen was preceded, in Krainer’s case, by some 15 years of basic research to determine the mechanisms that underlie RNA splicing. And those discoveries, Stillman noted, followed closely upon another great scientific triumph, occurring simultaneously at CSHL and MIT almost exactly 40 years ago.